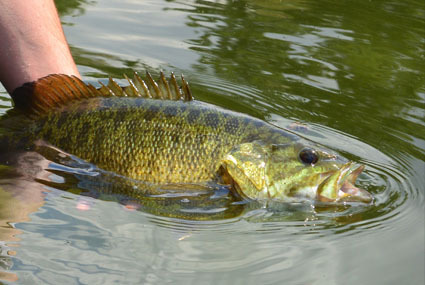 Northern Michigan bass start to become active during the prespawn period, which usually begins in May. Fishing only gets better as the water warms, and the bass swarm the shallows to spawn. Inland waters warm earlier than do the East and West Arms of Grand Traverse Bay, so there are typically several different options for lure and fly presentations depending on the waters being fished. In northern Michigan, the mayfly hatch can be king. Just about every species, it seems, gorges up on these bugs. This can be a fantastic time for awesome topwater action. Fishing can be superb all the way through September and into October, when the smallies are fattening up for winter. Imagine the exhilaration of being able to see bass cruising in 30 or 40 feet of water, and being able to cast to these fish, watching as they inhale your offering.